When the newly elected president's daughter is kidnapped from her private college dorm, he calls on ATF agent Jack McClure to work with the Secret Service to find her and bring her home. McClure is unknowingly thrown into the middle of a political war as the outgoing president tries to use the kidnapping as an excuse to take down a group that opposes his agenda and ideals. 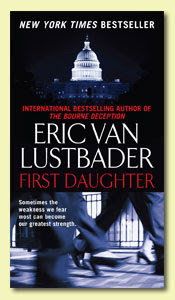 First Daughter by Eric Van Lustbader is a fast-paced thriller, featuring a whole cast of unique characters, from political figures to street thugs. There are many twists and turns throughout the entire novel, which make it exciting and hard to put down. I was constantly trying to figure out who the "bad guys" were, changing my mind every few chapters. I have to say I never actually figured it out until moments before McClure did. It was definitely a page-turner all the way to the end. Through flashbacks that are smoothly incorporated into the story, we get a deep understanding of McClure's past and its effect on who he is today. One of the unique aspects of McClure is that he is dyslexic. This caused much suffering for the character throughout his childhood, and a great challenge in his adult life. But seeing things differently than others is actually an advantage for McClure in his work as an ATF agent. He notices things that others miss, and is able to piece together the pieces of a puzzle in a way that others cannot. Overall, First Daughter is a great crime novel, but it's also a story about a man reflecting on his life and his relationships, and coming to terms with the past to make a stronger future. I look forward to reading about McClure's next adventure in Last Snow. This review was written based on a copy of First Daughter that I received from the publisher, Forge Books. Sounds good!!! Please enter me in. I'm a follower. OH! OH! Enter me, I like crime thrillers as an occasional break from fantasy, and this sound like one Jeff would enjoy as well. you for the giveaway opportunity! This book sounds absolutely fantastic. Thanks for the chance.